Minister for Agriculture Michael Creed describes Fergal Leamy's tenure at the helm of Coillte as 'one of huge success'. 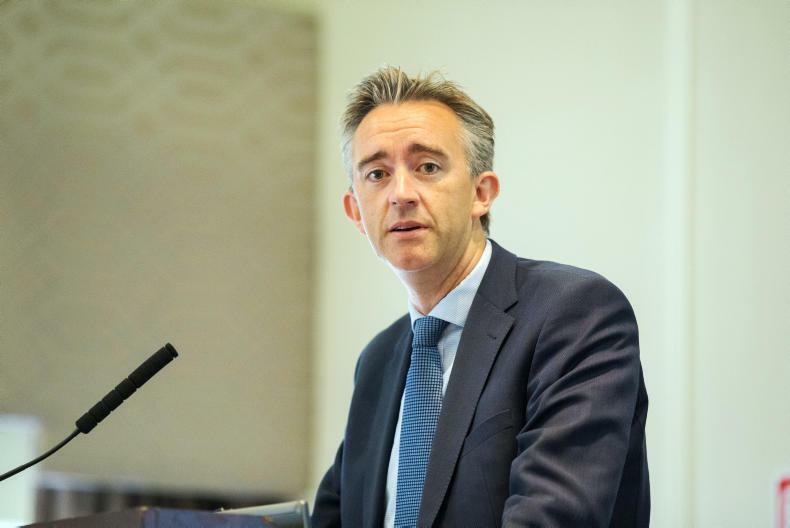 Fergal Leamy will depart from his position as CEO of Coillte at the end of June this year, it has been announced. It is understood he will be taking up a new role in the private sector. In a statement, Leamy said that "the transformation and growth of Coillte has been driven by the motivation, commitment and dedication of our people and I want to thank the team for their hard work and support". 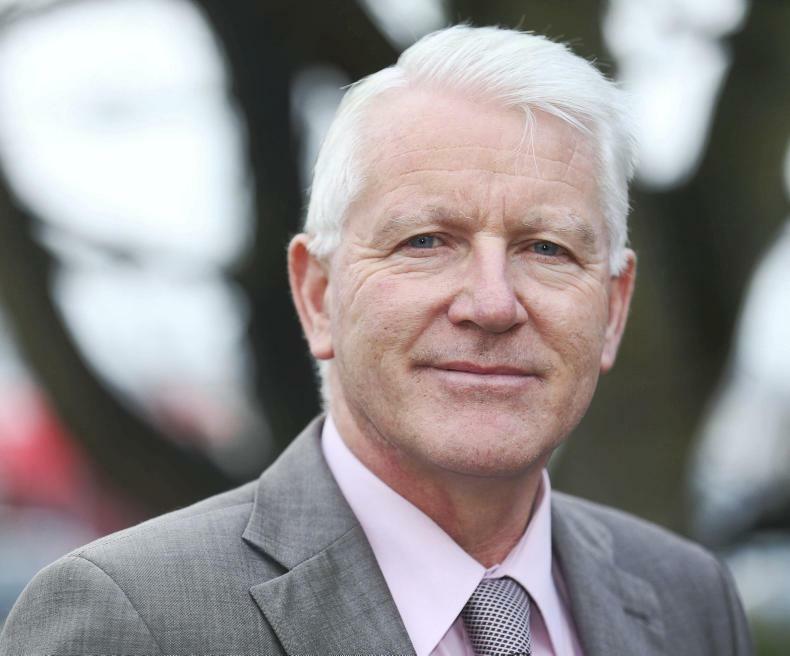 Leamy noted Coillte's performance in 2018, when earnings rose from €85m to €115m. "We also achieved a successful sale of our wind assets for €136m which represented a five times return on our investment. Coillte has now achieved its strategic objective of achieving a 5% cash yield on its €1.4bn asset base. The company is in a strong position and has an excellent team in place to lead it into the future," he said. The Minister for Agriculture Michael Creed said that Leamy’s tenure has been one of huge success for Coillte as reflected in the turnaround in its commercial performance since his arrival as CEO four years ago. "The priority now will be to appoint a successor who can lead Coillte through its next phase of growth and arrangements for the process to select this person will be announced in due course," Minister Creed said. Still the forest and timber capital of the US – this is the first impression you get of Oregon. It’s been 27 years since I last visited the Beaver State and as I head south through Willamette Valley, with Mike Barnes of the Oregon Small Woodlands Association (OSWA), who host my visit, the memories flood back. Timber trucks, logging towns with sawmills and board mills crop up repeatedly, while to the east, the ever-present Cascade Mountains with their densely covered Douglas fir forests and to the west lies the Oregon coast range. Oregon has an area of 255,026km2, about three times the size of the island of Ireland but unlike Ireland, 47% of the land is under forest. Douglas fir is the state tree and the symbol of the importance of forestry to Oregonians. The species covers 35% of the total forest area, but its contribution to the economy is huge in sawmill, panel board and pole production. In one forest I visited, the company operated by Ken Nygren was removing transmission poles up to 120ft (37m) in length. The state tree appears on the number plates of cars, and in tourist bric-a-brac – from toys to T-shirts and coffee mugs, to baseball caps. The second impression is that land use has visibly changed, at least in the rich soil type of the Willamette Valley since I last visited Oregon in 1992. Forestry remains at the same level, but agriculture and horticulture are also major industries here, led by the greenhouse industry with close to $1bn in sales followed by cattle and calves ($0.7bn), hay ($0.6bn), milk ($0.5bn), grass seed ($0.5bn), with a plethora of other crops including wheat, potatoes, pears and blueberries, with a cumulative value at $1bn. While Oregon is three-times the size of the island of Ireland, it has a population of only 4.3m. So 80% of Oregon’s agricultural production leaves the state, with 40% exported to 100 countries but mainly to Asia. Elsewhere, there are subtle changes in land use and these quickly become apparent, with hazelnut and wine production the most obvious. Farmers and other landowners have no fear of changing land use here, if there is a market available for their produce. For example, during my previous visit, the state had 70 wineries with 2,300ha of vineyards. Now, Oregon boasts 778 wineries with 13,500ha of vineyards, producing international award-winning wines. Despite pest and disease damage in recent years, hazelnut production continues apace in Oregon. Filbert farms (filbert is the name for the tree and nut) increased from 12,000ha in 2008 to almost 30,000ha last year. Turkey is still the biggest producer of hazelnuts in the world, but the US is catching up. However, it’s really Oregon that’s doing the catching up, as it accounts for 99% of all US hazelnut production. While forestry is the backbone of the economy, forest activity doesn’t seem as busy compared with my first visit to Oregon or is it just my imagination? I asked Oregon Forestry & Industries Council (OFIC) president Kristina McNitt, and Seth Barnes director of Forest Policy. Their answer is the same: forestry activity has decreased over the past three decades for a number of reasons, but mainly due to passive management of federal forests. Between 1989 and 2011, the volume of timber harvested from federal lands in Oregon dropped by approximately 90%, but despite constraints, harvest levels on private land have held up remarkably well. Today, 78% of all log production is sourced from privately owned forests growing on 34% of the forest estate. Despite owning 60% of all Oregon’s forests, less than 20% of production is harvested in federal lands. Clearcutting was the norm until the 1980s, but when I visited Oregon last, clearfells were being phased out on federal lands for a number of reasons including the protection of the endangered northern spotted owl. Clearcuts have now ceased on federal lands which means, at most, selective thinning. The debate continues in Oregon on whether this approach is really protecting the spotted owl but a more contentious aspect of passive management is placing federal forests and neighbouring private forests at risk from fire, according to Kristina McNitt. “Solutions to decrease unchecked wildfires and increase the production of sustainable wood products in our federal forests must be part of the dialogue of Oregon’s cap-and-trade programme,” she said last year. The programme is designed to set a cap on total greenhouse emissions, whereby Oregon’s largest industries would be required to buy pollution permits to cover their emissions. She believes that the threat of forest fires could be alleviated by intensive forest management in federal forests, just as it is managed in productive private forests and she hadn’t changed her mind when I visited the council’s HQ. “Instead,” an exasperated McNitt said, “forest owners in Oregon pay more in taxes to protect forests against fire than in any other state”. She clearly believes the solution to fire damage lies in the hands of the federal government in cooperation with private growers, while climate change goals could be achieved if Oregon’s policy makers supported wood products. Over the coming weeks, I’ll feature some of the views of Oregon’s influential forestry stakeholders including Peter Daugherty, state forester, Todd Payne, president and CEO, Seneca Sawmill Company, Mike Cloughesy, director of forestry at Oregon Forest Resources Institute, staff at Weyerhaeuser and members of Oregon Small Woodlands Association (OSWA), who are visiting Ireland this week. Many sawmill owners in Europe and America own forests to provide continuity of supply, especially during periods of timber shortages and high prices. Forestry evolved differently in Ireland compared with countries with strong wood cultures. As a result, none of the large and medium Irish sawmills have their own forests. The large attendance at the recent field day in Co Leitrim discovered the advantages of forest ownership, especially when owned by a sawmill. Crowe’s Sawmills Ltd near Mohill, established in 1903, is not only unique because it is the oldest sawmill in Ireland, but it also produces a ready supply of timber from its own forests. One of these is a 13.5ha mainly Sitka spruce forest, established by Mack Crowe in 1989, adjacent to the sawmill. 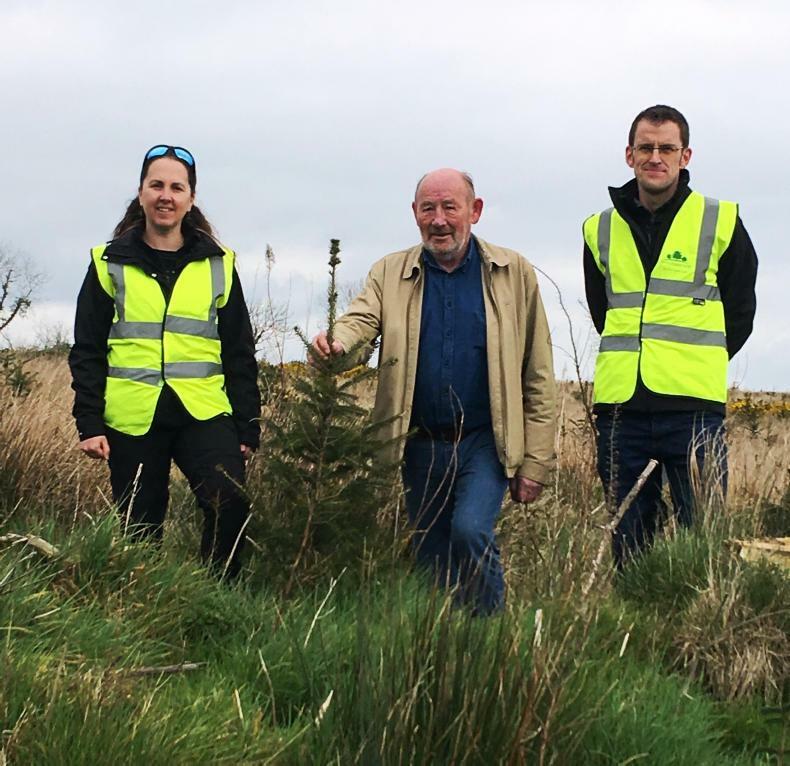 Mack Crowe (centre), Crowe's Sawmill Ltd, on his reforested site in Mohill, with Marina Conway and Victor Barber, Western Forestry Co-op, who managed the planting and maintenance. “We carried out three thinnings from year 16 up until the area was clear-felled in 2017,” he said. At that stage some of the forest had suffered from windblow, but all the material was salvaged as the Sitka blew over without shattering. Growing their own forest by a sawmill means that instead of paying €2,500 for a truck-load of quality spruce, Mack and his son Alan have the raw material available on their doorstep free of charge. Well, not exactly free, because there are maintenance, harvesting and reforestation costs. However, mill ownership provides major advantages especially when the timber is only a stone’s throw from the sawmill. Adding value to spruce and minor conifers. The reforestation challenges facing forest owners are similar to afforestation, but with a number of significant differences. The forest owner has the advantage of knowing how the reforested species will perform based on the performance of the original crop. Also the site is likely to be well-roaded. The site will require mounding and reforestation sites will contain lop and top, which makes planting difficult unless it is windrowed, or removed for wood energy. 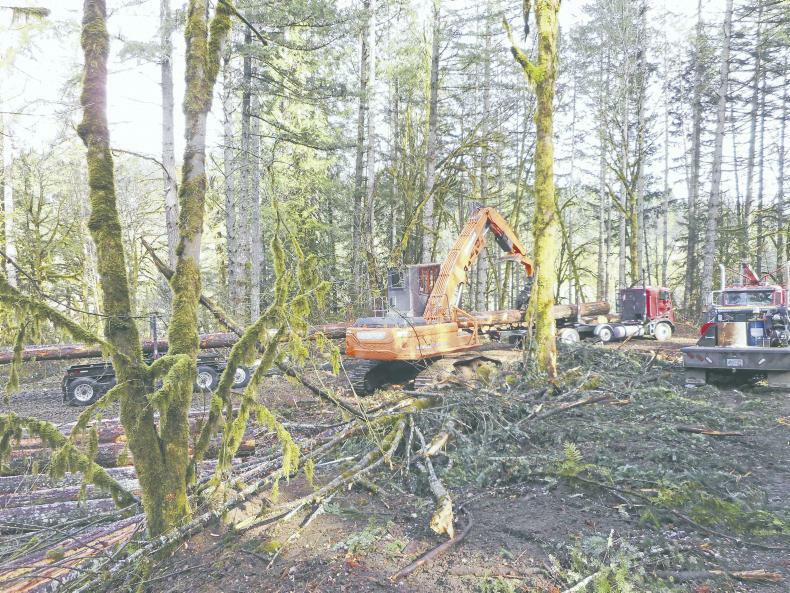 Unless the site is planted quickly after clear-fell, major problems can arise during reforestation, explained Victor Barber, harvesting and sales forester with Western Forestry Co-op. “Get in as soon as possible after clear-fell to beat vegetation competition and plant the strongest and best-quality nursery trees,” he advised. “Choose strong trees also because they are more resilient against large pine weevil damage, which is a major challenge on reforestation sites,” he said. Pre-dipping trees in the nursery allows three months or more protection and coupled with spot-spraying, it should protect the crop. Without regular inspection and control when required, weevil can cause serious damage to young plants. The times to be specially vigilant are April and May and again in August, as the emerging adults feed on the bark and underlying tissues of newly planted trees. Sitka spruce is still the predominant species, but covers 78% of the area compared with total cover in the original plantation. The remaining area comprises 22% birch, alder and red oak along with open spaces and setback from watercourses and a ring fort. This will reduce productivity significantly in the second rotation, which receives no State funding for loss of income. Crowe’s Sawmills, once a producer of construction and pallet timber, changed its product range after the collapse of the construction market in 2008. Today, the emphasis is on adding value to its timber by producing high-quality fencing, flooring, panelling, gates and products aimed at leisure and other niche markets, while construction timber for farm buildings is also an important outlet. Over the years, the mill has changed from being a wholesaler to a predominantly retail business, with strong reliance on internet business. It can process large logs averaging 60cm in diameter, unlike many of the larger mills. However, the main difference is its ability to add value not only to Sitka spruce, but a wide range of minor conifers, especially larch and pine species, Douglas fir and Norway spruce. Timber produced from Leitrim forests is sawn in mills such as Crowe’s, but most of the medium to large material is processed in two Co Galway sawmills – the Murray Group, Ballygar, and ECC in Corr na Mona – with most of the small logs and wood residue going to Masonite in Carrick-on-Shannon. 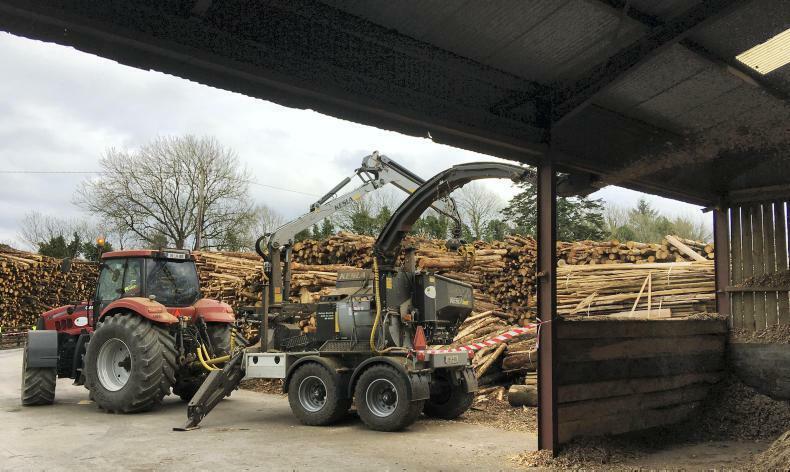 The Keslan C645T-2 chipper at McCauley Wood Fuels Ltd, Mohill, Co Leitrim, providing wood chips to local enterprises and businesses which have converted to renewable energy. Woodchips from McCauleys displace 150,000 litres of home heating oil every week." There are other markets such as horticulture and bedding, but a really growing outlet is wood energy, as exemplified by McCauley Wood Fuels, in Mohill. “The last place I want to see timber from our forests going is to McCauley Wood Fuels,” joked Marina Conway, CEO of Western Forestry Co-op. However, she acknowledged that wood energy is now a major sector and McCauleys is a key outlet for small and low-grade logs, ensuring that there is no waste in the wood production cycle. Brian McCauley and his son Kenny have grown this market steadily over the years. Just as the Crowes switched their marketing philosophy after the construction crash, so did the McCauleys. Brian and Kenny identified a market opportunity for wood chips and firewood and have grown both markets steadily. “We are certified under the Wood Fuel Quality Assurance scheme, and our customer base ranges from small-scale domestic users to commercial and industrial markets such as hotels, leisure centres, piggeries and wood processing plants,” said Kenny. McCauleys now purchase and process 10,000m3 of timber annually, comprising small, crooked and other inferior logs that don’t make it to the construction and fencing markets. Kenny McCauley said that wood energy has huge potential in Ireland, especially for small, low-grade forest logs. He also maintained that wood energy can play an important role in helping Ireland meet its climate change targets, just as it is doing in countries such as Austria, Denmark and Sweden. “Timber that is chipped here displaces 150,000 litres of home heating oil every week,” he said. For decades, forest owners have been stating that forests and their products can help to solve climate change. Now, the message that trees are the number one way in which carbon can be removed from the atmosphere, stored in vegetation and forest products over the long term is being bombarded at a global level. 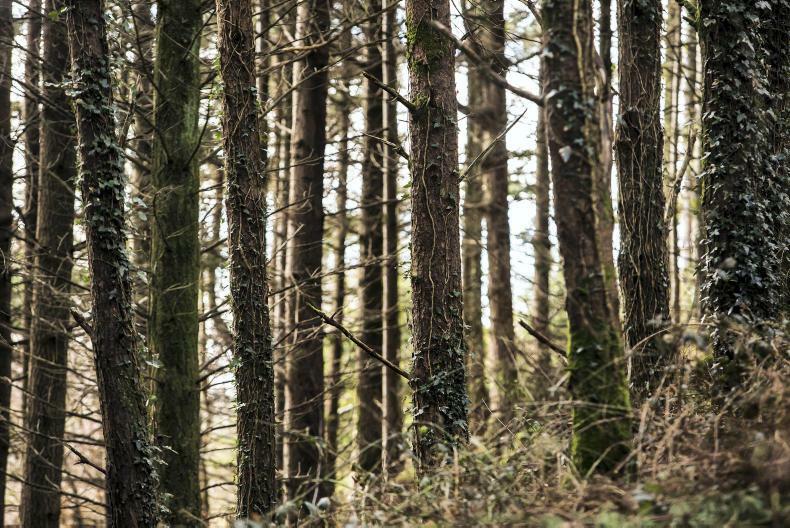 Nearly half of the forests in Ireland are privately owned, predominantly by farmers, but farmers’ engagement in the sector has been dwindling in recent years. These family forests, or farm forests as we call them, are a large untapped resource for combating climate change. It is estimated that since 1990 alone, over 31,000kt CO2 have been sequestered, which was valued at €180m in 2015 using a carbon price of €5.80/t. In recent times, there has been a lot of talk on the IFA farm forestry committee on how farmers can get a payment for the carbon in their forests. It wants to better understand the potential of the market and to generate additional income from the forest, as well as beginning to understand the different options and systems that are operational globally, and the complexities with each. It is a daunting process. The carbon market offers new opportunities and challenges. Presently, there is a prohibitive expense of bringing a forest to the carbon market– a process that involves taking an inventory of the trees, assessing the forest’s carbon content, estimating future growth and submitting to several levels of auditing. However, technological advances are reducing the costs associated with valuing carbon. Innovation will be extremely important in the carbon market to bring smaller forests into them. If family forests can get past the barriers, the carbon market could be profitable, particularly as carbon prices are forecast to quadruple by 2030 in Europe. There are ways to overcome these barriers, with new systems being designed continually. Only recently the New Zealand government, which has been at the forefront of carbon payment for private forest owners, has announced a new carbon payment system that would pay private forest owners a regular payment based on future earnings. By taking a long-term view of the amount of carbon in a productive forest, forest owners will be able to trade more carbon at lower risk, and not have to worry about repaying when they harvest. It is essential that the right incentives are put in place over the long term if we are to deliver our afforestation programme, as well as our commitments in taking action on climate change and supporting the transition to a low-emissions future.